In his 1980 essay, The World of Tomorrow and the Person of Tomorrow, the psychologist Carl Rogers contemplated the future. He described those who would usher in this new era as people with the capacity to understand, bring about and absorb a paradigm shift. He added: "I have an uneasy feeling about this chapter… It is a beginning, an outline, a suggestion… I believe that what I am saying here will some day be fleshed out much more fully, either by me or someone else." Maureen O’Hara and Graham Leicester are uniquely qualified to flesh out Carl Rogers’s vision (Maureen worked closely with Rogers for many years). Here they explore the competencies – the ways of being, doing, knowing and organising - that can help us navigate in complex and powerful times. They argue that these competencies are innate and within reach of all of us – given the right setting, plenty of practice and some gentle guidance. But they are seldom seen because they are routinely undervalued in today’s culture. That must change, the authors insist, and this book is intended to begin that change. 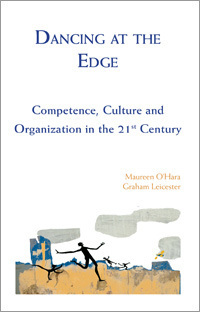 "We find that people who are thriving in the contemporary world, who give us the sense of having it all together and being able to act effectively and with good spirit in challenging circumstances, have some identifiable characteristics in common… They are the people already among us who inhabit the complex and messy problems of the 21st century in a more expansive way than their colleagues. They do not reduce such problems to the scale of the tools available to them, or hide behind those tools when they know they are partial and inadequate. They are less concerned with ‘doing the right thing’ according to standard procedure than they are with really doing the right thing in the moment, in specific cases, with the individuals involved at the time. In a disciplined yet engaging way they are always pushing boundaries, including their own. They dance at the edge." "I found this to be a most refreshing book. Instead of yet one more book about the Leader of the Future, we finally have a book about the Human of the future. This is a book about you and me. What must we all become if we are to cope with the global changes that are upon us. What might planning to learn entail? This book lays out a very complete prescription. We must 1) enlarge our consciousness, become more mindful, especially of ourselves and our immediate environment; 2) enlarge our network of relationships, become more willing to work with others, especially with other cultures; 3) enlarge our knowledge base, become wiser in our decision making taking into account the growing cultural diversity of the world; and 4) enlarge our capacity to act in innovative and countercultural ways..."